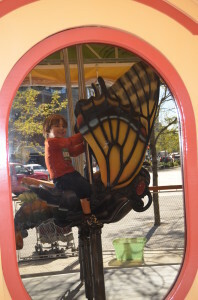 Boston, Mass – Here’s the thing about the New England Aquarium: even though we get in free as members, we still have to pay $22 to park the car. Trying to be a financially responsible person, I had this brilliant idea that I would take the twins there by public transportation, just like our babysitter used to do. This is a little bit of a process, requiring a bus ride, followed by a ride on the T, followed by a short walk. According to Google Transit, the trip should take 40 minutes. Of course, Google probably does not take into account that it always takes twice as long to get out the door as I think it should, guaranteeing that we will not be out on the street waiting at a bus stop when our bus goes by, so we will definitely have to wait an extra 20 minutes for the next one. Google also overlooks the fact that the walk from the T-stop to the Aquarium crosses the Rose Kennedy Greenway right in front of the Rings Fountain, causing a diversion that can take anywhere from 5 to 60 minutes. Long story short, we didn’t make it to the Aquarium. But the sun was shining and the twins were having a ball and using up lots of energy. So we decided to stay outside and see what Boston’s newest attraction had in store for us. 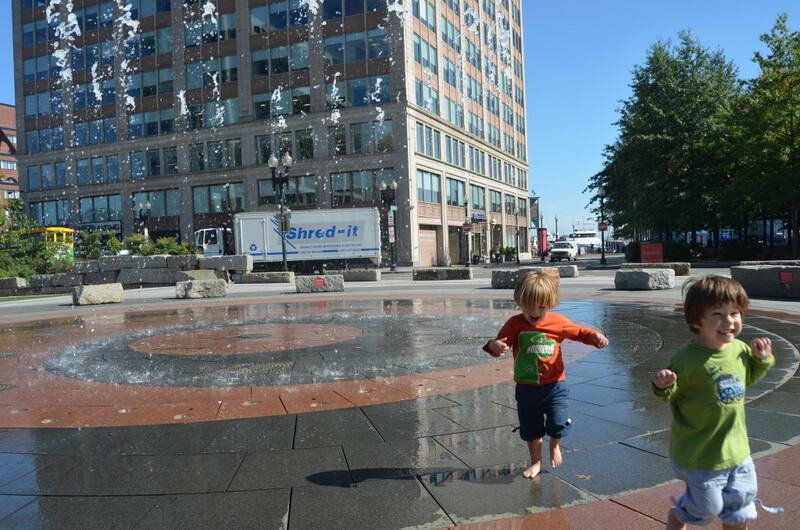 For non-Bostonians, the Rose Kennedy Greenway is a ribbon of parks and plazas that now winds its way through downtown Boston, occupying the space where the Central Artery used to run overhead. (The highway now tunnels beneath the city, thanks to a very long, drawn-out, way-over-budget construction project, best known as the Big Dig.) The Greenway is a lovely network of landscaped gardens and fountain-lined greens, with an artist market for Saturday shoppers and food trucks for weekday lunchers. Each year, they seem to add a few fun attractions along the route. The twins have frolicked in the Rings Fountain many times, so that was nothing new. Nonetheless, they can’t resist playing Russian roulette with the water, which spouts up in unpredictable patterns. They got soaked. Fortunately, it was 75 degrees out today. Afterwards we went to check out the custom-designed, Boston-themed Greenway Carousel, which was just unveiled a few weeks ago. The creatures are apparently based on drawings of New England wildlife originally done by local school children – lobsters, sea turtles, rabbits, skunks and more. Personally, I would have taken a ride on the fierce peregrine falcon, but the twins had their own very strong opinions. Finally, before making our way back home, we stopped at the Armenian Heritage Park, also on the Greenway. The centerpiece of this small park is a labyrinth with a bubbling fountain at its center. I explained to the twins that they had to try to stay on the path and make their way to the center, similar to the mazes that we sometimes do on paper. The guys loved this game, and they patiently walked/ran the entire labyrinth, before finally arriving at the fountain. (Then they promptly threw their sippy cups into the fountain, which I don’t think is supposed to be a part of the ritual, but whatever…) Much to my surprise, when I asked them later, both twins agreed that the labyrinth was their favorite activity of the day. I was curious about the Armenian link to the labyrinth, but I could find none. Its origins are in Greek mythology. Apparently, Daedalus built a complicated, multiple-branched maze to confuse and contain the mythical half-bull, half-human Minotaur; he did such a good job, that he almost couldn’t find his own way out. Despite this story, a classical labyrinth is typically a unicursal design, meaning that there is only one unambiguous path that eventually leads to the center and out again. 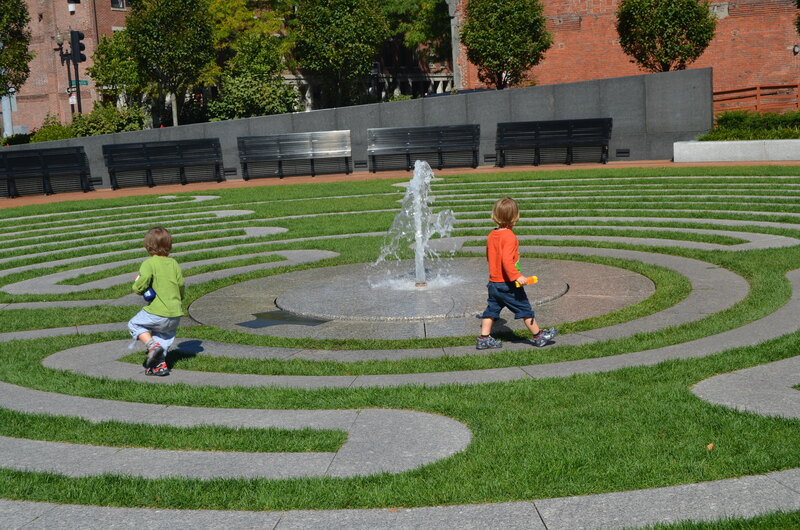 The labyrinth at the Armenian Heritage Park is such, which explains why the twins were able to find their way. Historically, labyrinths have often been used for meditation, providing a focal point to still the mind and center the spirit. I’m not sure that the twins’ introduction to this practice resulted in any stilling or centering (especially considering the sippy cup antics) – but it can’t hurt, right?